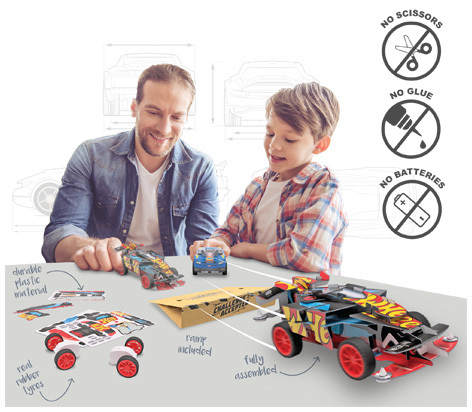 Available in both single and double packs, Bladez's fantastic new Maker Kitz are the Hot Wheels™ cars YOU build. The cars are simple to assemble... just pop out the durable and pre-cut plastic panels and assemble the tough, snap-fit parts! No scissors, glue or batteries are required and there are assorted designs to collect. Add power with not one but two turbo pull-back motors to hit scale-speeds up to 300mph! The robust assembled car is tough enough to race, even the gnarliest stunts using the launch ramp included! Don't miss out on added fun by downloading the STEM Activity sheet to calculate YOUR scale speed! 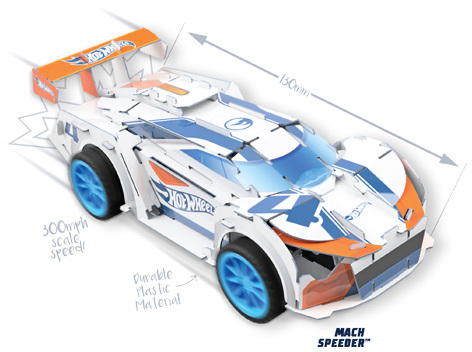 Build, Race & Collect Bladez Hot Wheels™ Maker Kitz! Please tell us what you think of the Maker Kitz by Bladez Toyz.